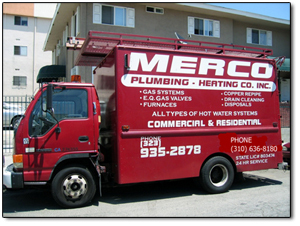 MERCO PLUMBING CO. is a family owned and operated company, with a combined experience of over 75 years in the residential, commercial and industrial plumbing industry. We cover all of the L.A. area and we offer 24 hour emergency service. We can service and replace all of the brand name plumbing fixtures, such as: kitchen faucets, bathroom faucets, toilets, and garbage disposals. We also specialize in hot water heaters, from tank less heaters up to commercial use for apartment complex, laundry mats, and point of use units. We do drain cleaning using the latest available technology for sewer cleaning and replacements.